the higher the quality of your ideas and project work. In the enterprise market, the opportunity being seized by companies is to better connect employees. The sheer size of these firms makes it obvious that they are not optimizing collaborative activities. Social software plays an important role in helping that. SunGard’s CEO has a great take on this issue in the New York Times. Spigit is introducing its SaaS application for SMBs, called WE. WE leverages the enterprise functionality of enterprise Spigit, but streamlines the features to account for a self-service process and cost in tune with an SMB’s budget. The critical things firms need for innovation are there: easy idea entry, community feedback, workflow stages, analytics, individual reputation scores, multiple ways to filter for ideas, social profiles, connections, activity streams, etc. It also reflects a slick new user interface, with multiple themes to choose from. You can see more about WE innovation management for SMBs on the Spigit website. And read eWeek’s coverage of the release here. When a small company starts out, it’s rather easy to stay on top of what colleagues are doing. There just aren’t too many of them. You easily banter, bounce ideas off one another and contribute your part to projects. The problem is that small businesses continue to rely exclusively on the tried-and-true methods of collaborative work as they grow. Keep on with the emails, the desk meetings, the lunches. Sure, it’s fun to keep with those who sit essentially in your visual perimeter. But it means you’re missing out on a lot of valuable ideas and insight from colleagues. The easy interactions of old are now replaced by the departmental exchanges, and the daily work inherent in those micro environments.The small firm mentality that employees enjoyed with fewer employees is no longer applicable as the company expands. Yet as research has shown, employees who are able to break out of departmental silos and leverage a diversity of connections perform better in terms of innovation. So how does this fit SMBs? 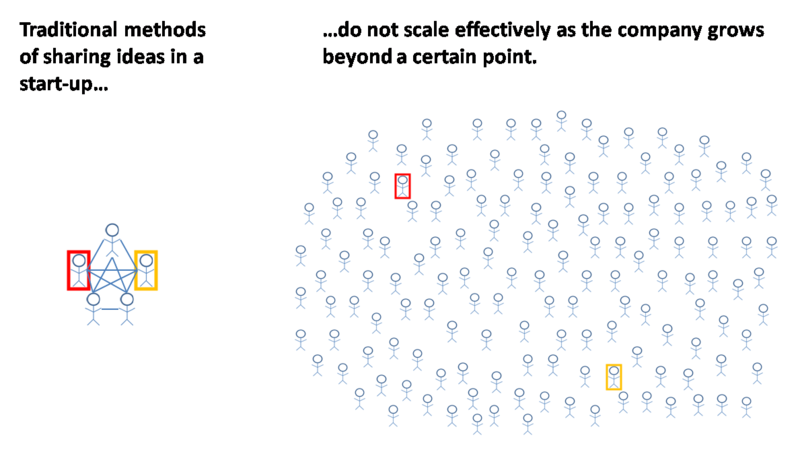 The value of a network is proportional to the square of the number of connected participants. Every new connection inside a company increases these information advantages, for all members of the network. The problem occurs when employees are only using traditional methods for making and accessing these connections: email, desk conversations, departmental meetings. They run into Dunbar’s Number. I use Dunbar’s Number here as a heuristic, describing the mental limit we each have to stay in top of what others are working on. 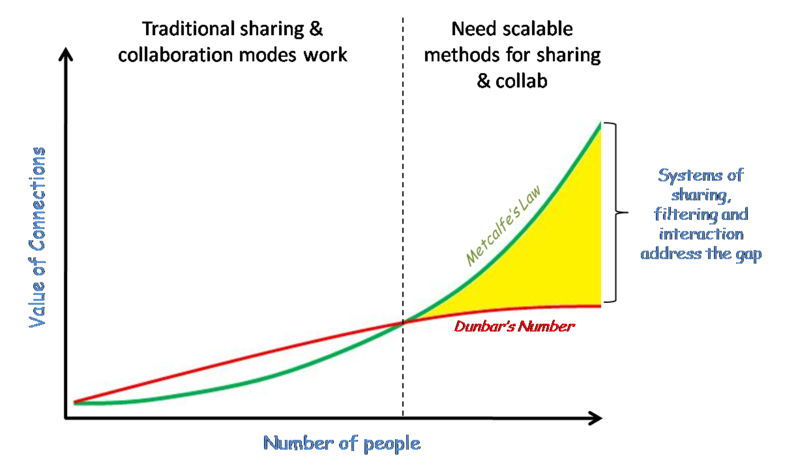 With traditional means of engaging in collaborative work, the Metcalfe’s Law advantages of information diversity are limited by our Dunbar’s Number ability to keep up with the new connections. He found that the MAXIMUM number of people that a person could keep up with socially at any given time, gossip maintenance, was 150. This doesn’t mean that people don’t have 150 people in their social network, but that they only keep tabs on 150 people max at any given point. 150 is a maximum number. Meaning for many of us it’s less. And I’d argue, in a work context, where we’re busy delivering on the daily tasks that define our jobs, it’s an even lower theoretical maximum. Which means at some point, small businesses begin to lose out on those information advantages when they rely only on traditional collaborative work modes. In the graph above, that’s the part of the graph where Dunbar’s Number crosses over Metcalfe’s Law. Call it the Metcalfe’s Law Opportunity Gap. At that point, companies need to look at systems that allow employees to share and filter information, and to interact with others outside their daily sphere of contacts. To access non-redundant information and points of view. This is a problem well-known to large organizations. It also applies to SMBs as well. It’s why they need social software at a certain point in their growth trajectory. This is an important issue for innovation. So many of these employees will have front line customer and supplier experience, and ideas for the business. But visibility on these ideas will get harder and harder as the firm grows. If this area interests you, check out WE by Spigit. Social software for SMBs. So here is the data – based on the early part of the Fibonacci sequence and where I have assumed that the Circle of Influence may be to the Power of 4. So a circle of 8 – the ideal Trusted Space – can attract, affect and influence 4,096 people. If I have 144 in my circle we can reach just over 400 million others. BUT my bet is that just as the reach goes up, the gravitational pull goes down. Notice anything? As we look at the sequence we see a Pareto or power curve – it’s the Long Tail. So what do I also “see”? I think that there are two power curves here. One is reach and the other is power or gravity. The greatest gravitational pull is at 2 – the most effective reach is 144. There is likely a “sweet spot” along the curve where reach and pull are best found in concert. My bet is that it is in using the circles of 8 – 13 – 34. You can reach more than a million people with 34 and you can really attract 4,096 powerfully at 4. If my intuition is correct, then the full power of social software might be revealed as we explore these numbers and their meaning. Does this not put a new face on marketing? Does it tell us how we will find and attach to content in a universe of infinite content? Does this say something about how to organize anything? Pingback: Words can’t hurt you. Lack of words can.